Less than a year after announcing that it intended to create a new market surveillance system – and six months after going live with it – the US Securities and Exchange Commission says that its cloud-based approach is paying dividends and allowing it to examine the structures of the markets it supervises at a greater level of granularity than ever before. Midas – the Market Information Data Analytics System – is based on High Frequency Trading software from Tradeworx and allows the US regulator to perform what Gregg Berman, associate director of the SEC’s Office of Analytics and Research, calls “full depth of book analysis”. The Tradeworx HFT system quickly brought the SEC up to some sort of parity with the powerful systems used by Wall Street Investment firms, but it will always be analysing the market to understand its structures rather than continually monitoring it, Berman said. This has led to some criticism of its technical capabilities, which he says are unfounded in the wake of Midas. The idea that market surveillance – as opposed to monitoring of individual firms could ever move to real-time, or even intraday is based on a misunderstanding of complexity of the problem. Looking across the market at those billion data points lets the SEC investigate the interplays of activities that lead to things like the Flash Crash of May 2010 – and to say that HFT was not the underlying issue. Berman’s presentation would not have pleased anyone in the audience opposed to HFT. “What’s illegal is illegal at any speed,” he said. While there are many questions about the role of HFT in the market, it is the SEC’s responsibility to better understand what is happening in order to inform the debate, which is what Midas will be assisting with. “If we don’t diagnose the problem properly we won’t get the right prognosis,” he said, adding that many problems in the industry are caused by “sloppiness combined with a lack of checks and balances”. Processing the data is “a huge task, but the trickier part is figuring out what is an outlier or an abnormality”, he said. With a billion data points, an outlier threshold of 0.1% gives 1 million potential outliers, he pointed out, adding “most outlier events are just that – events”. Yo fintech! 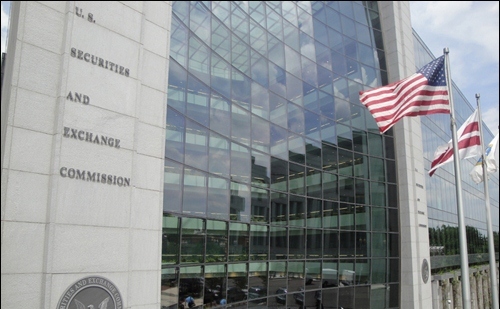 Don't mess with the Securities and Exchange Commission. I’m a celebrity... get my ICO out of here! US Securities and Exchange Commission makes two people in/famous. An overview of the current fintech regulation in the US by the prudential regulators: the OCC, the FDIC, and the Federal Reserve.